Tailored to use in conjunction with all Race Ramps Products. Made with 100 percent recycled rubber tires and plastic and a much improved gripping system to the bottom of the wheel chocks. Our 40 inch Sport Ramp is built just for their needs. If you want a no-fuss but still solid ramp for your sports car, this is for you. It can handle tires up to 8 inches wide and raises your car up 7 inches -- basically, it's a sweet little ramp that gives you a lot of access. Our 67 inch Race Ramps XT have a gentle, 10.8 degree angle for your low clearance vehicle -- but don't let that "gentle" stuff fool you. Our solid core design ramps are the toughest around, supporting up to 3,000 pounds and tires up to 12 inches wide. Wheel Cribs are a safe, lightweight alternative to jack stands. They cradle the tire 8", 10", or 12" off the ground (depending on the model), providing unobstructed access underneath the car. 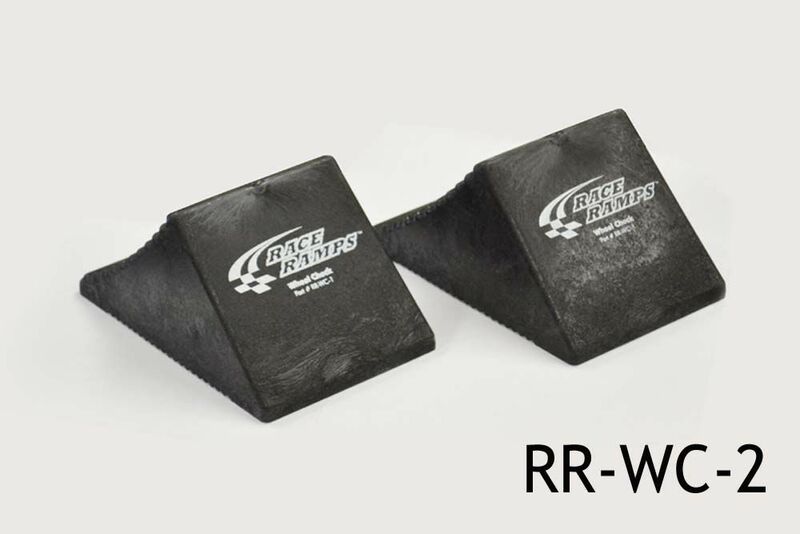 Wheel Chocks Tailored to use in conjunction with all Race Ramps Products. Made with 100 percent recycled rubber tires and plastic and a much improved gripping system to the bottom of the wheel chocks.